At one time, in the Moslem part of India [Kashmir], there were 38,000,000 cities. In one of these—in the one called the Western Moslem City—there lived a couple with three sons and three daughters. At one time, they became so extremely impoverished and destitute that they had only one jar full of rice left as their food supply. They agreed they should not eat this last provision and stored it in a hidden place. Then, the three sons went south in search of food. The three daughters went north. The father went west. While they were gone, a very poor beggar came to the door asking for food. The mother, who had stayed home, opened the jar of rice and gave it to the beggar. The father, sons and daughters replied in unison, “Even had you done something like this previously, it would not have been with our consent. Not only did you not go with us in search of food; you robbed us of our earnings at the same time!” Saying this, they threw her out of the house. From Kashmir, the old woman traveled west to Persia [Orgyen]. In Orgyen, all males were dakas and all females were dakinis. Therefore, it was said that by merely traveling there, a person’s awareness would naturally become clear. It happened to be harvest time, so the woman gathered some grains together and loaded them onto her back. She carried this into a city and established herself as a beer seller. At that time, the master Virupa “of the East” (shar phyogs bir wa pa) or Later/Younger Virupa (bir ba pa phyi ma), was living in a nearby forest of Orgyen, where he practiced secret conduct with his consort yogini Avadhutima, who frequently went to the town to buy him beer. Most often, she purchased beer from the old woman beer vendor, because the beer she sold was far more delicious than that sold by the other vendors. One day, the old woman asked, “Yogini, after you buy my beer, who do you take it to?” The yogini replied, “In the forest of Yaki lives an excellent yogin. I bring it to him.” The old woman said, “Well, in that case, you do not need to pay for the beer”, and gave her the very best portion of beer to take with her. When the yogini returned to the forest, Virupa said, “How is it that you were able to acquire this beer for free?” She replied, “There is a new beer seller with devotion; she is unlike the other vendors we used to buy from. I told her that my excellent lama lives in the forest and that I bring beer to him. The beer seller was moved to devotion and gave me this beer to bring.” Virupa said, “At all costs, I must deliver that old woman from the three realms of samsara.” So the yogini returned to the market and asked the old woman, “Will you come?” The old woman felt very inclined to go, so she accompanied the girl to meet him, bringing with her a jug of beer and some pork. During that very meeting, Virupa bestowed upon her fully the secret practice, the four empowerments of the nirmanakaya chakra at the navel. He also taught her the generation phase, completion phase and secret practices, along with instructions in the magnetizing activity. She transformed into a wisdom dakini right at that time. At the time that she was thrown out of the house by her husband and children in Kashmir, she was 59 years old. When she came to Orgyen and established herself as a beer seller, she was 60. When she met Virupa and requested empowerment, she was 61. Then, in the course of that one night, her 61 year old physical body purified itself and transformed into a youthful, attractive, very white rainbow body. Her silken hair flowed down her back. She became as beautiful as a sixteen year old maiden, ravishing to behold, and sat up in the sky for seven days. Thus, she became known as the miraculous dakini known as Sukhasiddhi. She then actually transformed into the Bhagavati Damema and became the secret consort of Virupa. 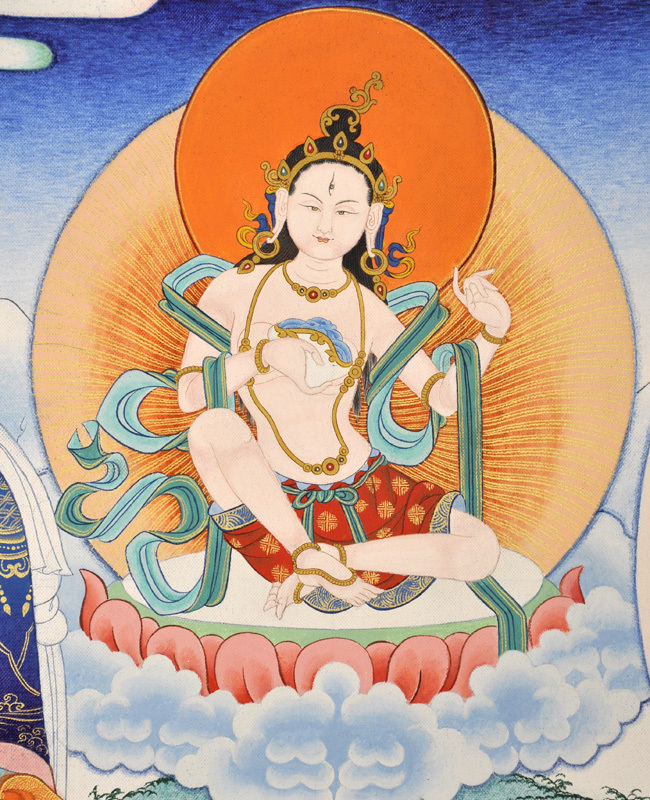 And indeed there are many instances in the biographies of later Shangpa masters in which she appeared to them in visions and gave guidance and profound instructions to them, some of which are included in the collected Shangpa texts. Lama Kyergangpa said, “When I went to Lhasa to see the emanation, Sukhasiddhi taught me Dharma, including the completion phase exercises, and bestowed the four empowerments. Now she is not separate from me for even a moment. Sangye Nyentön said, “Once, when I was staying for awhile with the one known as Kyergangpa, I saw Sukhasiddi face to face. She repeated these words to me three times, “Rest in non-referential awareness”. From that time onwards, I have continuously seen her face before me. I requested from her the four extraordinary empowerments. She made many prophesies such as, “You will become a yogin who masters the three doors to complete liberation.” And “If you and your students wish to attain buddhahood in a matter of years or months, go to an isolated place and engage in this secret practice and you will accomplish the goal.” May there be auspiciousness.